After the runaway success of the British Science Fiction comic 2000AD, IPC launched a series of short lived titles in its wake to capitalise on its popularity. However, the likes of Starlord and Tornado had a very short life before becoming integrated into 2000AD. In the mid eighties, a new title, 'Scream!' was their attempt to move into the relatively untapped Horror comic genre. There may have been several factors as to why they chose horror as the theme, such as the popularity of Stephen King books and the novels of British author of James Herbert, who had seen success with the likes of The Rats and The Fog. Another reason why IPC chose Horror as a good platform for a new comic launch could have been the greater access to horror movies due to the home video boom of the early eighties. Horror films proliferated in the early days of video rental, a situation that created the Video Nasties phenomena and its resultant legislation encapsulated in the Video Recordings Act. The controversy surrounding films such as 'The Evil Dead' and 'The Texas Chainsaw Massacre' only gave Horror greater exposure. Also, the theatrical and subsequent video release of Horror anthology 'Creepshow' introduced the world of EC horror comics to a wider audience, years after controvery and political pressure had killed off the likes of 'Tales from the Crypt'. British produced Horror comics had been around in the 1970's, with the likes of Shiver & Shake and Monster Fun, but these had been played for laughs and were more Scooby Doo crossed with The Beano than Hammer Horror in tone. Scream was generally a serious attempt at a British Horror comic, though some times it could not quite decide what it wanted to be - more on that later. Further back in time, British readers had been thrilled by the American imports of EC comics. In an event that preceded yet predicted both the backlash against 'Action'(see here for more), and the type of moral panic that enabled the legislation against so-called 'Video Nasties', the British Conservative Government introduced the 'Children and Young Persons (Harmful Publications)' act in 1954, becoming law in 1955. The american horror comic imports were almost immediately removed from sale. For more information on this subject, Martin Bakers definitive account 'Haunt of Fears' is a must. There is a link to the google book at the bottom of the post. By the late Sixties and early Seventies, the publisher Warren was re-introducing the British public to horror with the likes of Eerie and Vampirella. There was also the smaller Skywald Publications with their Nightmare and Scream anthologies. There was an obvious appetite amongst the British for a serious Horror title, and IPC aimed to fill that gap in the market. 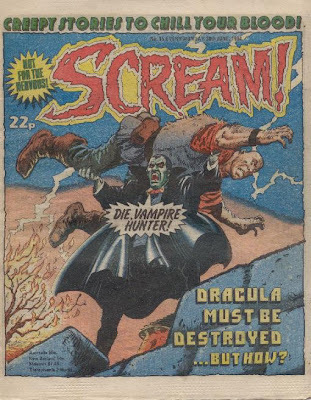 3) Due to the comics content, IPC executives were quick to avoid any repeat of the controversy that ruined the Seventies boys comic Action, another IPC comic, and therefore pulled the plug on Scream! "As for why the axe fell, rumours still persist to this day. Was the comic just too gruesome for the IPC bigwigs? Or was it just another victim of the hard financial realities of the Eighties? Whatever; with those fifteen Scream! comics now considered collector’s items by latter-day fans, it’s achieved some sort of life after death - which is entirely appropriate when you think about it." Scream was absorbed into another IPC comic, the revived Eagle (aka Eagle Mk II) from the middle of July 1984 until March 1985, when its name was dropped from the title. Naturally, due to limitations on the amount of pages in comics, very few of the strips from Scream! made the transition. Only The Thirteenth Floor and Monster made notable appearances in Eagle. The fact there was no mention of the merger in the last issue of Scream, coupled with the delay in Scream appearing in Eagle (a matter of weeks as opposed to a seamless handover) suggests the cancellation of the title was an abrupt one. 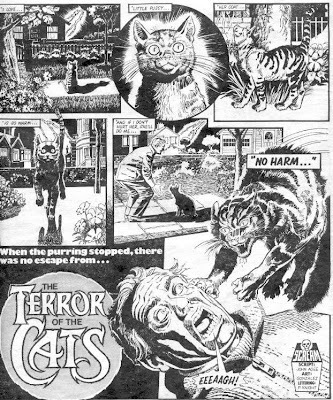 'Monster', which was one of the better strips had its first issue written by Alan Moore, though he did not contribute any other material to Scream. 'The Thirteenth Floor' was actually a collaboration bewteen 2000AD stalwarts Alan Grant and John Wagner, writing under a pseudonym of 'Ian Holland' (according to the Wiki entry for this strip). The artist was Jose Oritz (who drew the magnificent Tower King for the revamped Eagle comic). 'Dracula Files' was probably my favourite strip, about the ubiquitous Count in 80's Britain. It was written by Gerry Finley-Day (author of Rogue Trooper & Harry 20 on the High Rock at 2000AD) and drawn by Eric Bradbury, who also drew Doomlord for Eagle. My memory of its end was like this - I went to get issue 16 on a Saturday, along with my 2000ad, and it wasn't there. After a few weeks of being told by the newsagent that it hadnt turned up, I got the message that it was not coming back. I didn't follow it over to the Eagle when it was merged into that title in the July of 1984.
where there are plans afoot to produce further issues of the comic. I wish them well. I wonder if there is a copy of issue 16 anywhere??? Anyone know? There must have been surely? I used the excellent Toonhound site for some of the research - a great site and well worth your time. Lew Stringers wonderful blog has some detail on a new book that reprints pre-comics code Horror titles in a new book - read it here. I used to love reading this comic when I was a kid, I am now 37 and allways wonderd what ever happend to this great great comic. Why was there only 15 comics and then nothing, how could this happen this was the bets thing to read when I was growing and then it stopped, there was no warning about this and I felt like my whole world at the time had come to an end. I just wish and pray that some day this great comic will be back in all its great glory for me to share with the kids of today. Long live scream. Don't be so harsh, it was for kids. If we still have memories and fond ones. Then it must have been pretty good. I’ve just found the poster, taken form the first 6 issues. It was rolled up behind some other stuff. Kind of what you would expect from a comic like Scream. I’m not too sure what to do with it as yet? I've just checked an ongoing sale on ebay; someone is selling a job lot of issues 2-15 inclusive, and current bidding, with 8 days to go, is 205 GBP! This works out as over 14 pounds for each comic. 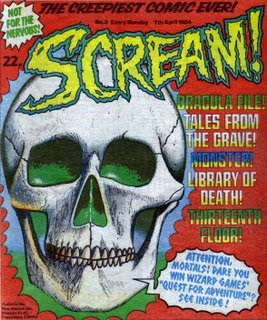 Good as it was, most IPC 1970s/1980s titles were 32 pages printed on cheap newsprint, 'Scream' included. Definitely one to watch out for at jumble sales etc!